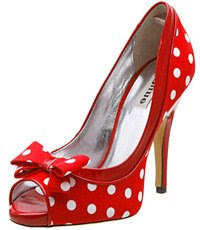 Props to the lovely Abi at Shoewawa for spotting these 'OMG I've just instantly fallen in love' polka dot peeptoe lovelies from Dune. 1. They're red. It is actual factual that red shoes are made of win and awesome. 2. They have polka dots. Polka dots are the ultimate pattern. 3. They have a bow. 4. The plain piping edge breaks it up a bit and adds a nice contrast. 5. It has a matching bag. 6. They are pin-up girl fantastic. So, in conclusion, if anyone would like to buy me a pair, they're £85 from Dune. Red shoes, no knickers - is that a well-known phrase or just my friend who says it? These are gorgeous. I want!